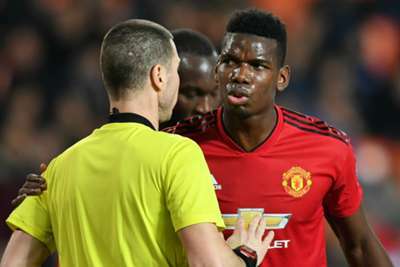 Jose Mourinho was left to rue Phil Jones' own goal and a lack of intensity as Manchester United ended the Champions League group stage with a 2-1 loss to Valencia. Jones steered the ball past Sergio Romero early in the second half after Carlos Soler had put the home side ahead at Mestalla on Wednesday. Substitute Marcus Rashford halved the deficit in the closing stages, but the goal did little to gloss over a poor display from the Red Devils, who would have topped Group H with a victory due to Juventus' shock defeat to Young Boys. Mourinho, who made eight changes to the starting line-up from last Saturday's 4-1 win over Fulham, felt his players were too "passive" in the first half in particular. "We scored two goals and instead of winning 2-1, we lost 2-1!" he told BT Sport. "But jokes apart, we were too passive in the first half, comfortable with the ball but not with intensity or big ambition. "In the second half, I was pretty sure that, after speaking at half-time, things would be different. I made the two changes [Rashford and Jesse Lingard] later and the team improved immediately: we started playing faster, arriving in more dangerous positions, we got to 2-1 and probably should have got to 2-2 because we had more chances to equalise." Mourinho appeared to have one eye on Sunday's Premier League trip to Liverpool given his team selection, but he insisted the visit to Anfield was not on his mind. "This is not about Liverpool, this is about the Champions League. I don't know how you can bring the Liverpool game into it," he said. "We go into every match with the intention to win. Sometimes we win, sometimes we don't. But the intention is always there." Mourinho was pleased to reach the next round given United's injury problems in recent weeks, particularly in defence, even if he admitted their performances in the six matches had not been entirely positive. "Job done, in a difficult group. I don't think we were brilliant in the group phase, but we got enough points to qualify," he said. "With the problems we have, the injuries we have, we managed to come here and be already qualified." Juan Mata, who missed a clear chance for a late equaliser against his former club, was happy to see some squad players earn playing time and is already looking forward to the last 16. "We tried to explore our qualities and tried to play as a team. Some players haven't been playing a lot and I think it was a very good day for some players to play some minutes," he said. "We tried to keep the ball. We did it sometimes, maybe not enough, and we conceded some chances. It was difficult, they were playing in front of this amazing crowd. "I think we reacted probably too late. We had some chances at the end where we could have at least scored again but, overall, we are disappointed because we know Juventus have lost. "From a personal view, it's very good for me to come here and feel the love of the club and the supporters. "We have to wait and see who we play against. As I said yesterday, we have to believe we can beat whoever it is. We are Manchester United. It doesn't matter if we play good or bad; we have to keep believing to respect this club, the history of this club."